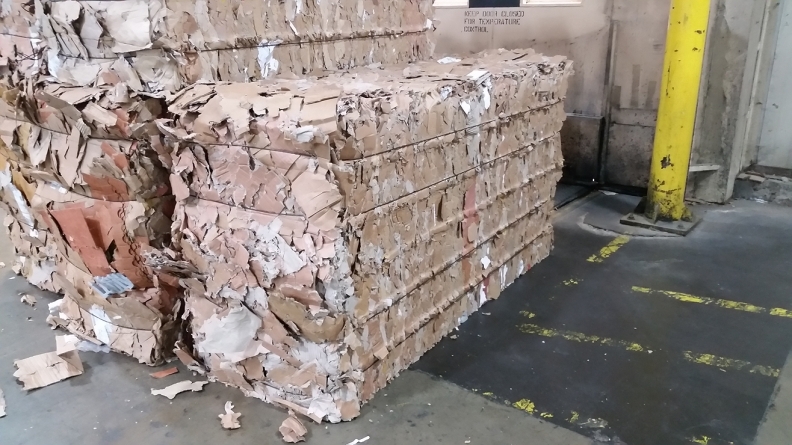 GM says cardboard and packing materials are baled at its manufacturing sites for recycling. Oshawa Assembly and the Canadian Technical Centre (CTC) Oshawa Campus are the latest Canadian operations to join GM’s growing list of landfill-free facilities. The company's waste-tracking efforts span nearly 25 years, according to global waste reduction manager John Bradburn. The company says it has more facilities that contribute zero waste to a landfill than any other automaker. On average, the automaker's 79 landfill-free facilities reuse, recycle or compost roughly 96 per cent of their waste and convert four per cent to energy, the company said in a statement Wednesday. The automaker's operations in Canada, South America and Mexico are now 100 percent landfill-free. "We aspire to be that zero waste company holistically everywhere," said Bradburn. "Part of that sequence of attaining that goal is to obviously get this done in certain regions and then grow it from there." Over half of the company's manufacturing operations contribute zero waste to a landfill, said Bradburn. "There are some regulatory hurdles that we need to work through relative to certain materials, as it relates to environmental regulation, and we're working through that," said Bradburn. "As well through what we call material substitutions and others." Some obstacles the program faces relate to local infrastructure, and not incorporating recycle, or reuse, re-purposing technologies available in that specific area, Bradburn said, which the company tackles by sharing best practices and mentoring companies to accommodate those materials. The challenge lies in finding homes for certain materials like thermosets or composites that don't traditionally recycle because the material is chemically bonded in a way that it's unable to be molded or shaped. "An example of that would be our Chevy Volt battery cover," said Bradburn. "That cover itself is a thermoset composite material which is needed to create a really good, structurally sound battery to perform in the Volt." The program repurposes battery covers by turning them into nest structures to assist an endangered duck species in China called the scaly-sided merganser. In a separate initiative, the program also repurposes steel shipping baskets that come in from South Korea. The baskets are used for raised garden beds, said Bradburn, and currently serve over 30 urban gardens in Detroit. "We want to show people that there's a sense of responsibility to be stewards of our Earth," said Bradburn, "and they can do it through initiatives like this." Also in Canada, GM recently proposed a project to build a 6.4 megawatt co-generation plant that will reduce the greenhouse gas emissions from its St. Catharines Propulsion Plant by more than 77 per cent using renewable landfill gas to generate electricity and recover thermal energy to power and heat the Plant.